Our pilots have essential qualities for an organizer : “innovation, top level program, respect of the security rules”. Laurent, Victor and their partners perform over 18 constantly evolving stunts. From one stunt to the next : wheeling, stoppie, circles, skids, drift, burn… then for the final, letting their tires burn until the blow-out! Concerning your show, first of all we had very favorable press coverage after the show, the spectators were satisfied. I am totally satisfied with your help with the necessary steps to get prepared for the show. The relationships with your team were really good. 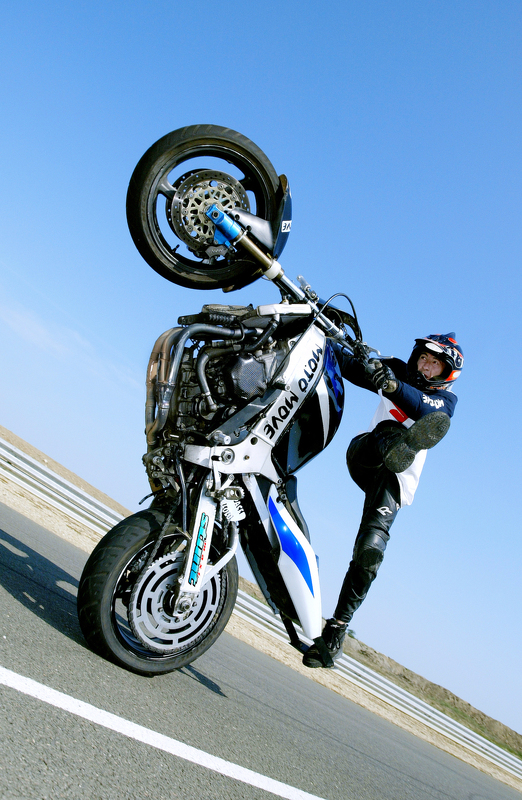 Stunt is a discipline where the biker performs acrobatics. This discipline practice is mainly for shows. The goal is to do as many of the most innovative stunts as possible one after the other; the basics being the wheeling (on the rear wheel), the stoppie (on the front wheel), the burn (blocked front brake to leave the rear wheel spinning) and the drift (sliding). Minimum track : length 80 m x width 3 m.
Duration to choose : 1 pilot 2x30min – 2 pilots 2x45min.